NEXTRA Allegro STEP converter is an converter integrated within OrCAD and Allegro to export STEP models of the PCB layout data. The STEP model can easily be imported into mechanical CAD systems using their STEP import filters. These models of the complete PCB including components can be used to verify installation procedures and collisions with mechanical parts. The circuit board is exported with the exact contour, the thickness of the PCB, all drill and milling information as well as all copper structures on the outer layers. Furthermore all elements of the circuitry transferred as one or as multiple shapes of an electrical net. 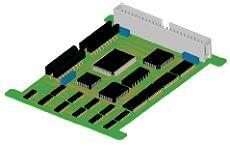 All electronic components will be replaced by models from a mapping library as 3D parts on the circuit board. If a mapping model is missing the PCB Editor information for placebound and height will be taken. The structure of the printed circuits design in the STEP file is multi-level according the manufacturing process steps of the manufactured and assembled board. The output format can either be STEP AP203 or STEP AP214. STEP models can not only be used in mCAD systems, another possible application include thermal analysis.